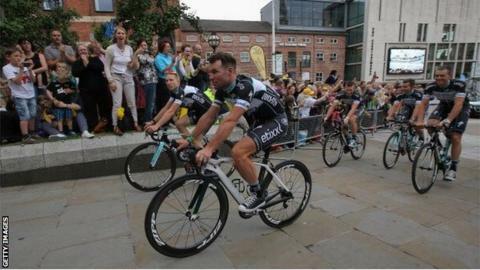 Mark Cavendish asked to be left out of the Great Britain squad for September's UCI Road World Championships in Spain. The sprinter, world champion in 2011, needed shoulder surgery after crashing out of the Tour de France in July. He will compete in the Tour of Britain, which starts on Sunday, but tweeted: "I requested NOT to be considered. There's better guys for the job." Sir Bradley Wiggins and Chris Froome are in a 14-man men's squad that will be whittled down to eight for the race. The 254.8km race, which is made up of 14 laps of an 18.2 km circuit, will feature more than 4,000m of climbing, with a maximum incline approaching 11%, meaning a sprinter is extremely unlikely to win the race. The British squad features Commonwealth road race champion Geraint Thomas, Ben Swift, Pete Kennaugh, Ian Stannard and Luke Rowe, all Team Sky team-mates of Wiggins and Froome. Women's elite road race (six from): Lizzie Armitstead, Alice Barnes, Hannah Barnes, Anna Christian, Lucy Coldwell, Lucy Garner, Nikki Harris, Annie Last, Sharon Laws. Twins Adam and Simon Yates, who ride for Australian-based team Orica GreenEdge, are also good climbers and chasing a spot in the team for the world road race on Sunday, 28 September, which will be shown live on the BBC. Wiggins, runner-up in last year's time trial, faces competition from Commonwealth Games time trial gold medallist Alex Dowsett, Thomas and Steve Cummings for one of two spots in that discipline. The 47.1km route is largely flat but takes in a steep climb and technical descent to the finish. Olympic road race silver medallist Lizzie Armitstead is one of nine riders chasing a spot in the six-strong women's squad. The race, which will also be live on the BBC, is on Saturday, 27 September. The women's race is on the same course as the men's, but takes in seven laps instead of 14. There will be no British representatives in the women's time trial. The championships in Ponferrada take place between 21 and 28 September.